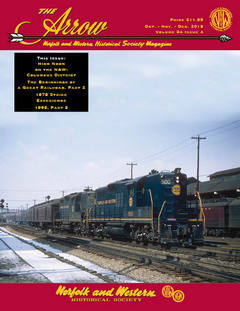 On the Cover: Winter and the holiday season always brings thoughts of train travel to mind for those folks who remember the era. Even though the steam era had ended some years, there were fans who liked trains and went out with their 35mm cameras and Kodachrome film and recorded some great images of an era now gone. Holiday traffic and mail are well in evidence on this December 1967 day as blue GP-9s 500 and 515 lead an 11 car Train No. 4, the Pocahontas into the Roanoke station. Four head-end cars lead what appears to be 3 modernized PG coaches and another coach. The Geeps are still fairly clean and well painted here showing some pride in the company about its passenger service. Map Here is a portion the 1916 map presented to the I.C.C. Valuation Hearings. This Virginian survey map shows which routes were surveyed (in white) and what route was actually constructed (in black). Photo For Further Reading The infamous 1978 strike was documented in book form and issued by the N&W in late 1978 and copies were given to each participating employee. It contains more details and a list of all the employees and their assignments. The N&WHS has the hardcover volume for sale in the Commissary for $15.95 (SKU# 142.13). This book has normally been $34.95 ($25.95 members) but we have to clear out some shelf space for new product. Every N&W fan should have a copy in their library, and what better time than now at a great price!